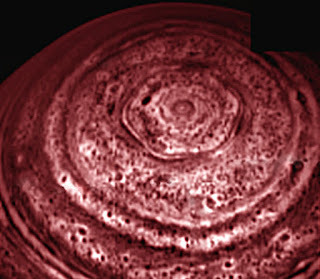 It appears that the UFO's, after putting faces on Mars and Monoliths on Jupiter (not to mention a Man in the Moon and terraforming North and Central America to look like a little old man's head), are now making crop circles -- or actually hexagons -- on Saturn. Who knows what sorts of crops they grow up there. You can watch it spin endlessly around, hypnotizing you and drawing you into the cosmic maelstrom here.